Named #38 of Top 75 Women in Business Blogs. Southwest Pilot Tammie Jo Shults has was it takes. Do you? Ambition and rule-breaking leadership hail from a new kind of Power Mom. Leaking secrets from the top can be toxic. Here's how to end that trip. Gloria's "The Sum:" 3 Things I learned this week: What are your points of power? And what are you doing for 50/50 Day? Check out how you can make your workplace shine. Be a force of positive change in your workplace, community and home. Compliment, uplift and endorse actions and behaviors that move us all forward. Cristal Williams Chancellor of the Women's Media Center, joins CBSNews to discuss the severe under-representation of women of color in U.S. newsrooms and why it matters to everyone. Leaders need a recharge, here's how. Here's the plan for gender and diversity inclusion. Why paying attention to women entrepreneurs pays off. 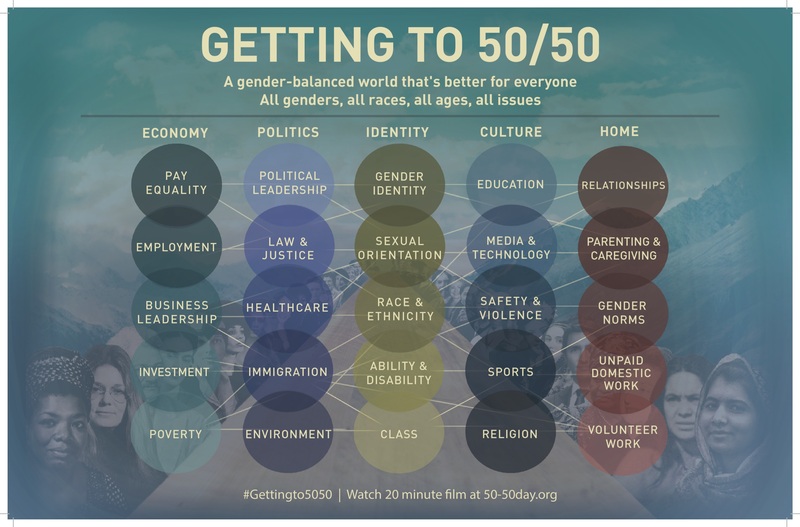 Please join Take The Lead Thursday, April 26 as we partner for the second annual 50/50 Day and the greater #GettingTo5050 Movement. Read more about 50/50 Day here. More than 32,000 events are planned in companies, schools, classrooms, museums and homes around the globe to work toward a more gender-balanced world. That’s better for everyone across all parts of society-- from the economy and politics to culture and home. Sign up to engage with short films, action pledges, discussion materials, and a full day of live-streamed programming featuring speakers, live events, and more. Everything is free. Join us. Advance women's leadership equality with our limited edition, Take The Lead Powertopia t-shirt. This design is ethically produced in the U.S.A. and has a soft, buttery feel. ‘Wearing your truth’ creates a culture of Love Over H8. 100% of the proceeds from this sale will be donated back to Take The Lead. Lyft is driving all of us to gender parity with donations to Take The Lead. When an existing Lyft rider uses the code, TAKETHELEAD17, or a new user signs up with Lyft by downloading the app and using the code TAKETHELEAD, Lyft donates $10 to Take The Lead.